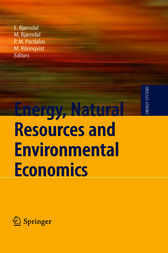 This book consists of a collection of articles describing the emergingand integrated area of Energy,Natural Resourcesand EnvironmentalEconomics.A majority of the authors are researchers doing applied work in economics, nance, and management science and are based in the Nordic countries. These countries have a long tradition of managing natural resources. Many of the applications are therefore founded on such examples. The book contents are based on a workshop that took place during May 15–16, 2008 in Bergen, Norway. The aim of the workshop was to create a meeting place for researchers who are active in the area of Energy, Natural Resource, and En- ronmentalEconomics,andat the same time celebrate ProfessorKurtJorns ¨ ten’s60th birthday. Thebookis dividedintofourparts. The rst part considerspetroleumandnatural gas applications, taking up topics ranging from the management of incomes and reserves to market modeling and value chain optimization. The second and most extensive part studies applications from electricity markets, including analyses of market prices, risk management, various optimization problems, electricity market design, and regulation. The third part describes different applications in logistics and management of natural resources. Finally, the fourth part covers more general problems and methods arising within the area.